Wikichucks, "The Personal Wiki With The Awful Name," is a windows-based desktop wiki. It is written in Autohotkey, and it works, that is, the exe file works, while the ahk file throws an error about a duplicate label. I have only begun playing with iWiikichucks!, but I am impressed—and, as you might have gathered, if you read many of my posts, I am not easily impressed! You just extract the directory from the downloaded zip file, and click on wikichuch.exe. It needs no installation, and it does not write to the registrry. But MS Internet Explorer needs to be installed. Links are inserted by enclosing a word or phrase in doubel square brackets, like so: This is a [[Free link]]. While it is not for the faint of heart, it is extremely customizable. The first thing I did was to get rid of the awful header. The second thing was to change the markup for italics ('') and bold ('''') to ConnectedText's markup ("//" and "**"). It was as easy as replacing those expressions in the wiki.ini.markdown page. You could also allow to have several kinds of markup by leaving both conventions. Any other markup, like Markdown's "*" and "**" would also do. Some of the other things, like headers, etc. Are also customizable. I will say more about my adventures with this desktop wiki in the future. would allow for the Markdown convention for italics as well. The author's use of "markdown" for "wiki markup" might be a bit confusing for those who expect Gruber's Markdown. It's just that the Surf was sold as a Rotring in Europe and North America under the Rotring label and under the Reynolds label in Australia, India and other Asian countries. The photograph is taken from an eBay seller from Australia. The difference between the pen is that they have their respective "manufacturers printed on the cap.Both have an "R" stamped on it, but the Reynolds nib seems less ornate. Both are cheap pens. But I can attest to the fact that the Surf writes quite well. So I recommend it for $10.00? Not really. Do I consider the Surf a Rotring? Just barely ... It is a Sanford pen. 1. Reynolds also was taken over by Sanford (Rubbermaid) in the late eighties of the twentieth century. The description of one of the Gallerys on eBay says: "Established in 1927 at la Ferte'-Milon in France, Reynolds has over the past eight decades been a leader in writing instruments in Europe and the rest of the world. In 1946, the headquarters and factory were shifted to Valence, in the south of France. The company is headquartered at Valence till date." But another site says: The year 1999 was a landmark year in the history of Reynolds. Since then it has been a member company of Sanford Corporation, USA. Sanford is a US $ 1.2 billion company. Sanford is in turn the writing instruments division of the US $ 5.9 billion Newell Rubbermaid group. Sanford has the broadest range of writing, marking, colouring and drawing products worldwide." This does not indicate how much they "streamlined" or narrowed the range of writing instruments. Many kinds of fountain pens became extinct since the Rubbermaid group felt it had to get involved. Notation seems to be a Notational Velocity, or perhaps better, an nValt clone for windows. I came across it through a Brazilian Website´. While I cannot read Portuguese, I can make out enough of the text to see whether it talks of something that might be of interest to me. :) since my favorite program was also developed by someone in Brazil, I was interested in Notation right away. I have not done much with it since downloading: imported my nValt notes from Dropbox (worked like a charm). I changed one of the entries, using Markdown syntax (also worked like a charm). Apparently, you can set up the application to sync with Simplenote by e-mail. I have not done that (yet). One difference between nValt and Notation is that the Search box cannot be used to create a new entry. You use Winkey + N. Purists might mind this, I don't. The help file is very rudimentary and information about the program can only be found through the "About" entry. This is a very promising application. What keeps me from using it? Apart from the fact that I really don not need another note-taking application, I cannot figure out where Notation stores its files. According to Levi-Strauss, bricolage consists of of research or thinking that is not looking for something that would go beyond the data collected and the concepts inherited from a tradition which may be "more or less coherent or ruined." There can be no doubt that a method like Luhmann's slip box may lend itself to this kind of approach—especially when it is combined with something that I discussed earlier under the title of "fieldstone method" and "flat outlines. Writing has to be more than collecting and re-arranging, if it is to be thinking on paper. To be sure, interesting thought links up with things that have already been thought, but originality or novelty does not consist in linking or connecting things that are found. It is concerned—at least in part—with answering questions, as Collingwood well realized. These questions need not be new, though some of the most interesting ones are. In the same way, flat outlines in writing might be the beginning, but it would be a mistake to think that they are the only useful way to outline, as some instructors seem to think. There is more to thinking and writing than mere bricolage. So you have decided you want to buy a fountain pen because you are tired of ballpoint pens—the "handmaiden of Beelzebub," or other inferior products that put more strain on the environment because they need cartridges, etc. What would be some of the criteria you should employ? Well, it seems to me that they should (i) either be piston fillers that draw ink from an inkwell, or fountain pens that allow you to use a converter. The first are few and far between nowadays, the second are plentiful. Almost every fountain pen that uses a cartridge can also use a converter. 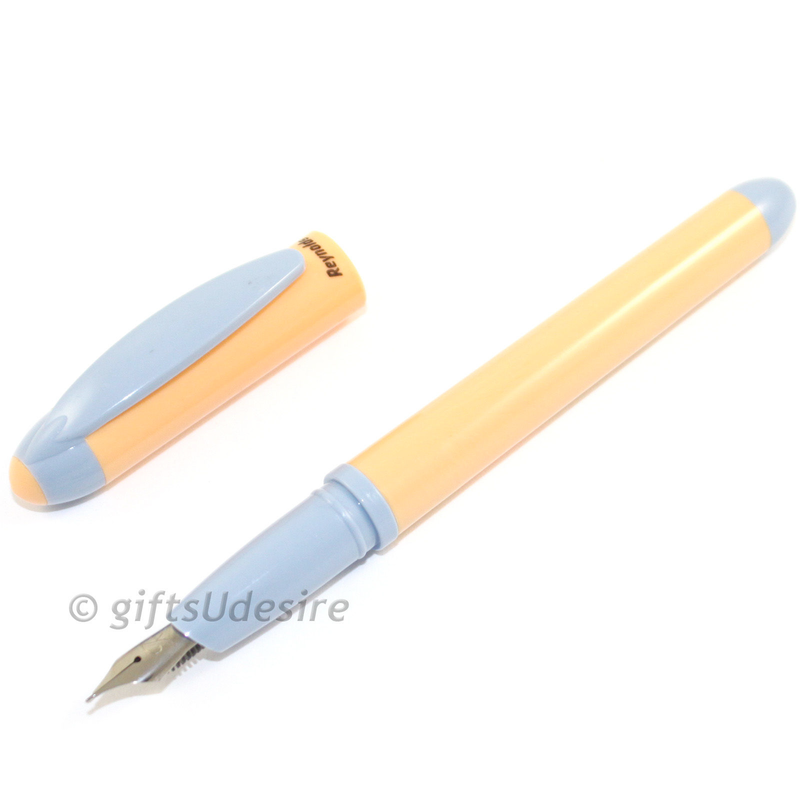 And (iii) it should be a fountain pen that allows you to change the nib or nib section easily and without any fuss, so that you are not stuck with the nib you with which you bought the pen. What are the alternatives? Lamy: almost all Lamy pens allow you to change nibs at will (with the exception of the Lamy 2000 (a piston filler whose nibs cannot be changed). So, Lamy safari, vista, AL-star, nexx, linea, cp1, accent, studio, logo and joy pens all take the same nibs. You could either buy separate nibs (for less than $15 at Amazon, or Goulet Pens, or many other outlets. Or perhaps you could buy different pens with different nibs that can easily be switched. You just pull the nib from one pen and put it on the other. It's easy. There is no need to do this right away or all at once, but you can do so at any time you feel like it. Lamy pens use two different types of converter, so be careful to see which one fits your model. There are the Lamy Z24 and the Z26 Converter. Usually there is one included with the purchase of the pen. If you want a cartridge for backup, make sure you buy the Lamy type as others won't fit. When you buy a Lamy, you buy an "eco-system," not just one pen. Levenger: The Levenger True Writer series, as well as many of Levenger's other pens, like the L-Tech (my favorite). You can easily unscrew the entire nib section and exchange it with another. The nib sections cost almost twice as much as the Lamy nibs (and the pens are a bit more expensive, but they are a good choice. TWSBI: The nib section exchange works the same as on the Levenger. Furthermore, it is my experience that some of the TWSBI nib sections work well on the Levengers. In fact, they work better in my experience. Some Edison nib sections also work well with Levengers. But you must do your homework to see which ones fit, even with the TWSBIs. There are other pens that work similarly, but the ones mentioned above are the most popular and most easily available pens. It's probably a good thing to go with one of these pens. The nibs on many other pens can also be exchanged, as the nib and feed are often just friction fit, can be pulled out, and be changed. But this is not for the faint of heart. You also need to know a great deal (and experiment to get it done). It's probably not something you want to do, if you are deciding to buy a pen for the first time. And perhaps you will never want to do it. The easiest in my experience are the Lamys and the Levengers. I have, of course, nothing against analogue tools. I do not just use them extensively, but I also collect them. Typewriters have little appeal to me, and not just because they are too big. But fountain pens are as fascinating to me as they were to Heidegger. I recently acquired a Rotring Lissabon. Rotring had for a time—just before the fountain pen division was closed down—a penchant for using city names for their products. "Lissabon" is, of course, German for Lisboa. There was an "Oslo," a "Madrid," a "New Orleans," etc. The pen is very rare. It never appears to have been sold in the U.S.A., and I read on "the Internets" that it received in 2000 a prize for best fountain pen in Europe. I have not been able to find out what prize that might have been. Nor do I understand why it would have received a prize. It looks good and, being made of brass, feels good to hold, but it is ultimately a bad pen. It seems to be an unfinished product. Not only is the nib and feed section not made by Rotring. It seems to be a rather cheap Chinese version, as evidenced by the inscription on the nib: "Iridium point, Made in Germany," but more importantly it evidently was not made for this pen. The feed is flattened on one side, so that if it is friction-fit into the proper barrel, it fits only one way. But there is no flattened side on the pen barrel. Accordingly there is very little friction to hold the nib into the pen. When I received it, the nib was very loose. I could make it sit a little tighter, but it remains loose. I would thus not advise anyone to take it on a trip. You might end up with ink all over the place. It does not write badly—it's sort of like a Jinhao X450. But I would not spend more money on it either, unless you collect Rotring pens and therefore must have it. I have not actually held this pen in my hand and do not know whether it fixes the issue I pointed out. ’m a fan of analogue tools. I depend on them. I incorporate them into my creative process no matter what I’m doing. When I’m thinking about the architecture of a piece of software, I use a whiteboard (and index cards attached to the board with magnets) long before I launch Xcode. ... And then there’s writing, of course. I mostly do that on an assortment of electronic devices – some new, like my 2013 MacBook Air, and some old, like my gorgeous PowerBook 150 from 1994 – but right now I’m using something a bit more vintage: a typewriter. Nothing wrong with that, I suppose ... a bit pretentious, perhaps ... and almost completely incomprehensible to someone who had to write his dissertation and first papers with a typewriter—only to have to pay almost $1000.00 to have the final versions typed up by a professional typist, but to each his or her own. Gemmell claims more, however: "I use them [analogue tools] to slow myself down. To introduce just enough friction that I’m compelled to pause. We don’t pause enough anymore. We don’t give ourselves time to think." And this is deeply weird. A typewriter gives him (and would give us, he seems to claim) "time to think." And how is this supposed to work? Strike a key too gently, and the letter will be faint or invisible. Strike the wrong key, and you’ll have to remove the paper, paint over the error with correction fluid, let it dry, reinsert the paper and roll it to the correct line, position the carriage, and try again. It’s onerous, and even when you get it right, it’s physically difficult. Give it some time, and the typewriter will be just as automatic as the computer keyboard—I am tempted to say. Have you ever seen a typist hammer away at a dissertation of which she/he understood little or nothing? No, probably not, come to think of it. In other words, "the older, simpler tools, with all their baggage and inefficiencies," distract from the task at hand, that is thinking what we want or need to think about. Rather they force the inexperienced user to think about how to accomplish putting thoughts on paper. Thinking about how in this way is just as bad in writing as it is in pole vaulting. In any case, there is no magical connection between a typewriter and writing. And Gemmell's post is in many ways a sign of a particular form of thoughtlessness. 1. There is still more that is wrong. I will mention only one: "We start too quickly. Indeed, we mistakenly believe that starting work means starting to produce." That is actually exactly the opposite of what I advise Ph.D. Students to do. There are too many people who "think" about what they are going to write without writing. You can't think complicated thoughts without writing. Therefore, it is necessary to start right away. And, as to an alternative to doing "our thinking piecemeal, interspersed amongst flashes of inspiration and fumbling in equal measure." I don't know of any. This article about spurious correlations is an interesting reminder that not all correlation amounts to causation, like the this one which correlates imports of crude oil into the U.S. From Venezuela and the per capita consumption of high fructose corn syrup. This is, of course something one needs to keep in mind while taking notes, though it usually is so obvious as not to need pointing out. But it's not always obvious, so I reminder might be somewhat useful. I consider the connection between the use of steel nibs and the lack of creativity in writing to be spurious, for instance. 1. It takes a while for the second link to load. I recently read this on a blog I had no business reading: Slaw: Canada's only online magazine. The blog entry is on Scapple, and the piece of wisdom at the end that caught my eye was expressed in "lawyerese". Here it is: "Software such as Scapple and Scrivener can do nothing without being driven by a creative person such as a lawyer." I agree: software programs are tools; like all tools, they don't do anything by themselves. It's the person who uses them who does or does not accomplish something by their means. There are better and worse tools. There are tools that enable you to do things you could not do without them, but even with them it is in the end the person who uses them who is decisive. This also holds for note-taking. There are too many people who believe that, if only they had the right tool they would be able to create great things. We should remember that it remains up to us create whatever we create, and that the tools are to a large extent incidental. Often, good enough is good enough, and the search for new and better is just a diversion. Some people who should know call it "crimping." I probably said this before: There is nothing wrong with diversions per se. Diversion may be wrong if it becomes a substitute for work, though some people's work is about diversion itself. I discovered this Website today. 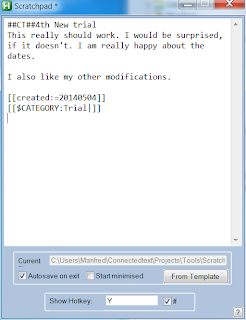 The Scratchpad will replace the one I created the more simple-minded script I wrote some years ago. The best thing I like about it is that it can create new content from a template. The script runs saves files in the same directory in which it runs. Templates are in a template directory underneath it. I run the script from a Dropbox directory. I can now import files created in this way as ConnectedText backup files. "##CT##" needs to be followed by the name of the topic. I have set the the ConnectedText import option to overwrite, if a topic with the same name exists. The expression "[[created:=%a_yyyy%%A_MM%%A_dd%]]" creates the topic with the creation time as an attribute. It all works correctly. 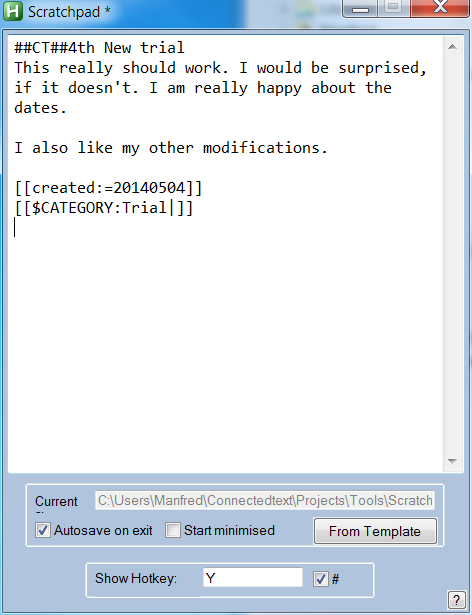 ConnectedText takes the name of the topic from whatever follows "##CT##", not from the file name. One cautionary note. If you choose the import option "overwrite," you have to be careful not to choose a topic that already exists, but you can always add a modifier to the topic that identifies it as imported, however. What do I need it for? I use it as a way of "backing up" or rather of writing to an import directory in Dropbox when I don't have ConnectedText available (or when I have forgotten to sync the office computer with the home computer). It's the best solution I have found so far. 1. I am very thankful to Desi Quitans who wrote the original script. Apparently it has been downloaded more than 4500 times. The other programs referenced on the Webpage are also very interesting. "Miss Stackpole, however, is your most wonderful invention. She strikes me as a kind of monster. One hasn’t a nerve in one’s body that she doesn’t set quivering. You know I never have admitted that she’s a woman. Do you know what she reminds me of? Of a new steel pen – the most odious thing in nature. She talks as a steel pen writes; aren’t her letters, by the way, on ruled paper? She thinks and moves and walks and looks exactly as she talks. You may say that she doesn’t hurt me inasmuch as I don’t see her. I don’t see her, but I hear her, I hear her all day long. Her voice is in my ears, I can’t get rid of it." She is not the only one he finds distasteful, and he wants his wife to "make a new collection." 1. I am grateful to Palimpsest for calling my attention to this passage. There is another passage on the steel pen on the blog See here. Compare with the previous post on Kierkegaard on Steel Nibs. I did not know that there ever were street typists in India. Nor did I know that they are in decline. But it does seem to be (have been) a great idea. You can't beat the rate either. 1. By way of spencerseidel, a Scrivener expert.